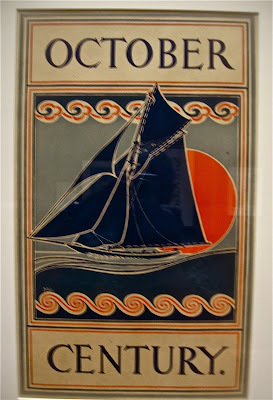 Fritz suggested that since we had to go into Manchester for some shopping, we spend some time at the Currier Gallery, the city's museum of art that has made the list of the ten best small museums in the U.S.. It was good when he introduced it to me fifteen years ago (it owns and gives tours through one of Frank Lloyd Wright's Usonian Houses) and is better now after a very intelligent expansion a couple of years ago. We take guests there, so he suggested we take out a dual membership and save money on our own visits and on the occasions when we bring others. The deal is incredible; for $55 per year, we get free admission for ourselves and two guests (four on one occasion), along with discounts in the cafe and gift shop, which we love and where we've done a lot of Christmas shopping over the years. So, we headed for Poster Mania!, the current main exhibit of American advertising poster art in the late nineteenth and early twentieth centuries. I've designed a couple of productions in poster art style over the years, most notably Cole Porter's Can-Can and Puccini's La Rondine, and was looking forward to see the posters up close. We had to pas through one gallery with a very mixed exhibit of furniture, pottery and wall art and immediately found ourselves in front of a work (above) by a close friend of ours, Al Jaeger. Al works in glazed and unglazed pottery with sand, ash, metal, pebbles, etc. to create pieces inspired by the sometimes lush, often rugged New Hampshire landscape. We own four of his pieces. This highly engineered piece is made of dark walnut. After this we passed into the main exhibit. 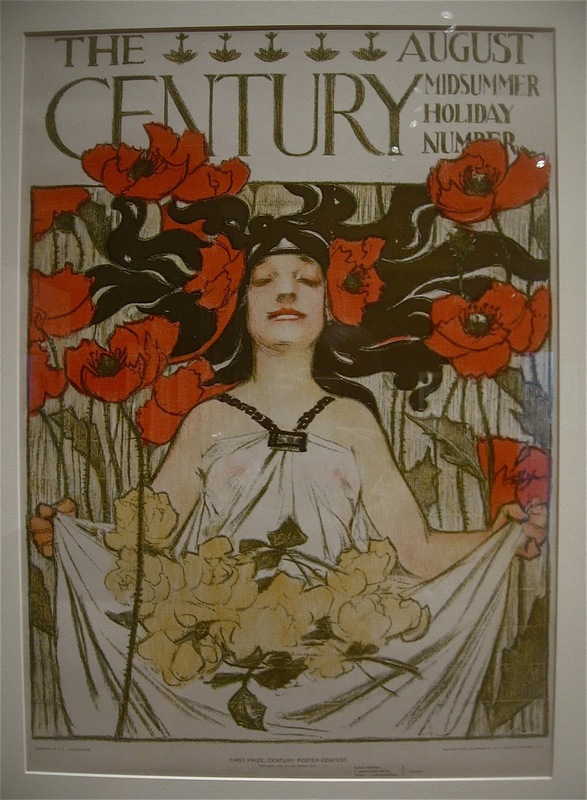 One of the most prominent of the American poster artists was Will Bradley. There must have been a half dozen pieces of his on display (the museum's holdings in poster art number two hundred and eighty, bequeathed by a single collector, Orien Dodge in the 1940s). Above is one of his most striking. Because of the reflective glass, several of my shots have reflections superimposed, like the exit signs over the black areas of the poster. This one was an especial favorite of ours. 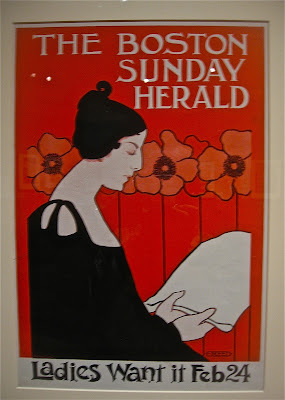 A large number of of the posters on exhibit promoted magazines, newspapers and book publishers. And as advertising posters were more and more used by the book publishers, women came flooding into the artist pool designing everything from the poster art to book layout and the embossed covers of the books themselves, the design of which was often echoed in the posters. This one made Ethel Read 's career. Virtually self-taught, she rose to the top of the profession but eventually fell prey to depression, alcohol and died young in England. 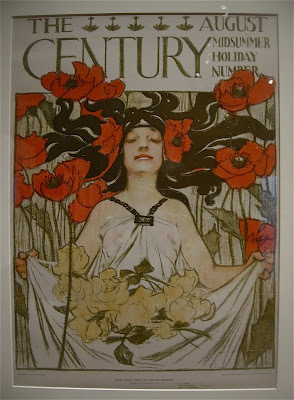 One of the great Art Nouveau classics. 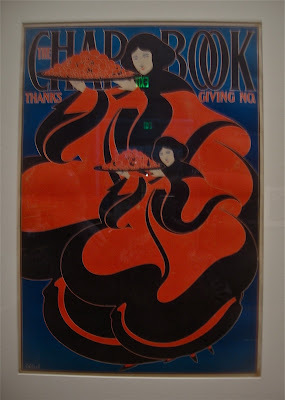 There are 90 pieces in the exhibit, all framed and displayed well with excellent notes on the artists, the reality of careers in poster art, biographical info on the artists, and a brief history of the craze for collecting posters that swept across the U.S. for about 40 years. On the way out of the exhibit we passed one of my favorite paintings, this cool, dispassionate view of classic brick mill buildings such as the ones on which Manchester's economy depended in the 19th and early 20th centuries. We had lunch in the cafe, then bought Christmas gifts in the shop. I ran the figures in my head and came up with $32 as the amount we had saved on our free museum entry, and discounts on lunch and shopping, more than half of the dual membership fee. Not bad, not bad at all! Back again after way too long! It's been four months since my last post, a hiatus I never wanted to happen. March and April were very heavy work months, with a major two-day Symposium that I gave on composer Giacomo Puccini at the Greenfield (MA) Community College -- my seventh consecutive year there, and they have invited me back again for an eighth next spring. This was a very major preparation job as to research, writing and preparation of visual displays as well as musical examples for both days a week apart) of the program. There were also two opera talks I gave in Boston: the first was a week before the Boston Lyric Opera's production of Mozart's Cosi fan Tutte, an opera whose sexual politics are as fresh and controversial today as they were when it premiered in Vienna in the late 18th century. The second was before the production of Benjamin Britten's The Prodigal Son produced by Intermezzo, The New England Chamber Opera, for which I design all the scenery and, recently, have teamed up with Fritz to write librettos for commissioned operas. The Prodigal Son is one of Britten's three "parables for church performance," the others being Curlew River, which we produced to very appreciative notices in 2006, and The Burning Fiery Furnace, which we may do in a year or two. Above is a relatively accurate photo of the backdrop for Prodigal Son. It was performed in the First Church in Cambridge with a very strong cast. We also had the financial backing of a generous grant from the Britten-Pears Foundation. We had big audiences and very good reviews. So April dragged into May and now suddenly August is staring me in the face. But I'm back and will be disciplining myself to do post at the very least twice and, i hope, three times a week. Thank you to those of you who expressed concern, especially David Nice who fully lived up to his name, and a couple of you whose names I had never encountered in the comments but to whom I am grateful for writing to make sure I was OK. I was delighted to capture a picture of a woodpecker couple this spring in the nesting season. We left the suet feeder up a bit longer than normal this year and think the returning birds appreciated having it as they got re-established in their summer territory. Then Fritz bought me a hummingbird feeder for my birthday in June, so now we can watch them not only in the garden but also close up right outside our big living room windows. Our cat loves watching them, too. The weather has been bad this year. Our first 90+ degree day was in March (!) and we have had three week-long or more heat waves in June and July with extreme amounts of rain and humidity. The climate is changing here faster and faster; when we were planning the house in 2005 and 6, New Hampshire still had maybe one 90 degree day a year. As to the rain, some of our perennials are failing from too much water, and I have been frustrated in not being able to do much more outside work than I have. I loved this picture when I came across it on the Web. 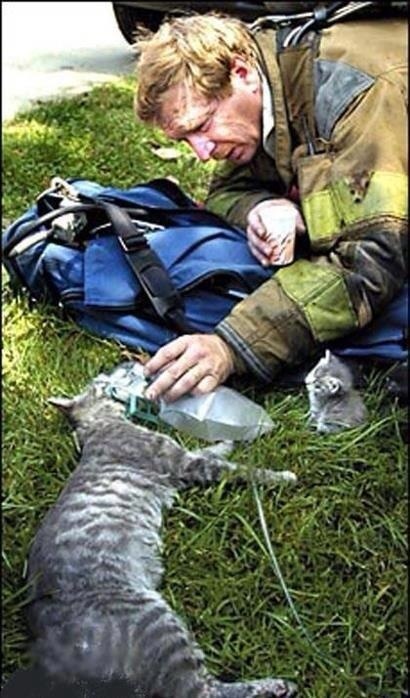 The scene is potentially heartbreaking as neither the little kitten, nor the firefighter who's trying to revive the mother cat with oxygen, has the slightest idea if she'll pull through. And neither do we, because no comment accompanied the picture.